The Décor Collection Series from EuroCave is the latest take on modern wine storage. With its unique color and wood finishes, the Décor Collection Series is specifically designed to fit perfectly in your living areas while showcasing your most impressive bottles. Embedded within the wooden exterior of the cabinet is a Performance 283 Wine Cellar. The Décor Collection Series from EuroCave is the latest take on modern wine storage. With its unique color and wood finishes, the Décor Collection Series is specifically designed to fit perfectly in your living areas while showcasing your most impressive bottles. Embedded within the wooden exterior of the cabinet is a EuroCave Performance Wine Cellar, which remains the best of the best from EuroCave. Individually handcrafted in a thirty-step process, the EuroCave Performance 83 will provide years of smooth, quiet, vibration-free service with the utmost ease of operation. Stored in these true wine cellars, your finest vintages will develop to their full potential. Also, the security lock and key will keep your valuable collection protected. 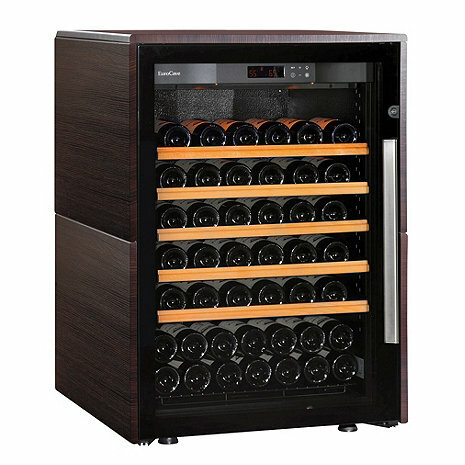 The single temperature cabinet re-creates the natural deep cellar and ensures a constant optimum temperature between 55°F and 57°F, but has a temperature range of 41°F to 68°F. The hygrometer provides an LCD display to advise of humidity range. Built-in alarm alerts when humidity level has fallen below 50%. Water can be added to cassettes to increase humidity to optimum range of 50-80%. Comes standard with 1 MDS Rolling Shelf and 1 Adjustable Shelf, all made of eco-certified beechwood. The Décor Collection Series is customizable to your specific needs, available in several color combinations and temperature ranges not shown. For all variations, please contact one of our Wine Storage Consultants at 800.377.3330. *Capacity is based off using standard Bordeaux size bottles, using larger size bottles may limit the capacity. If you would like to store larger bottles you can easily adjust the height of any of the shelves. Additional shelves will lower capacity. Warranty: 1 year on Parts & Labor and 5 years on the compressor. Electrical Requirements: Plugs directly into a US 110 Volt outlet on a dedicated 15 AMP line. This item ships directly from the manufacturer via White Glove Delivery. Please allow 12-16 weeks for delivery. Select items will have additional shipping charges, please see above for this item's additional shipping charge. With White Glove Delivery, we bring your item into your home, unpack it, inspect it, place it where you want it to be, and dispose of the packaging. Delivery is by appointment. We will call you to set a date. Please note that Stair Charges may apply for locations with 5 or more stair steps.